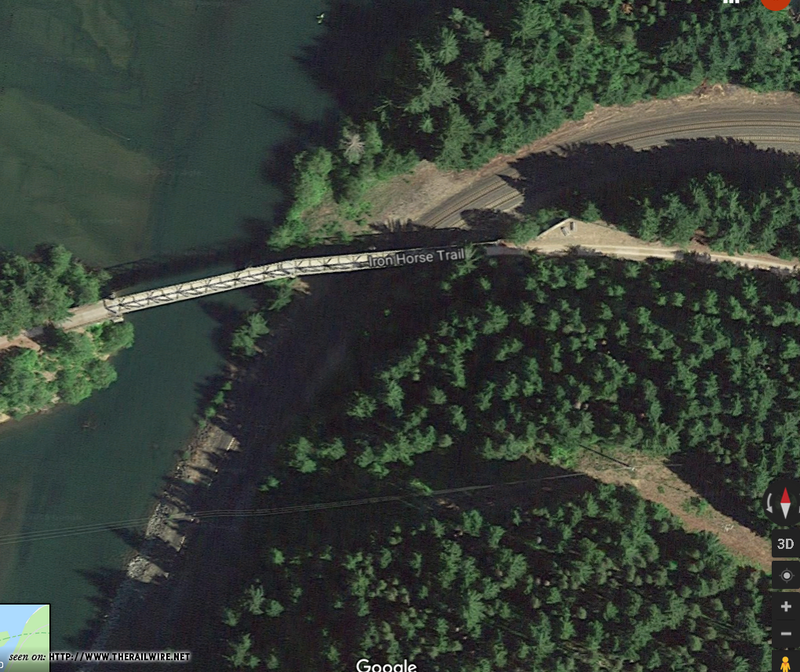 I'll address the challenge with a corner module representing the Milwaukee RR's overcrossing of the Yakima River and the NP just west of Easton, WA where the Yakima River enters Lake Easton. The Milwaukee has since become eh Iron Horse Trail, but I'll be modeling the appearance in the 60-70's when the original bridge still stood. 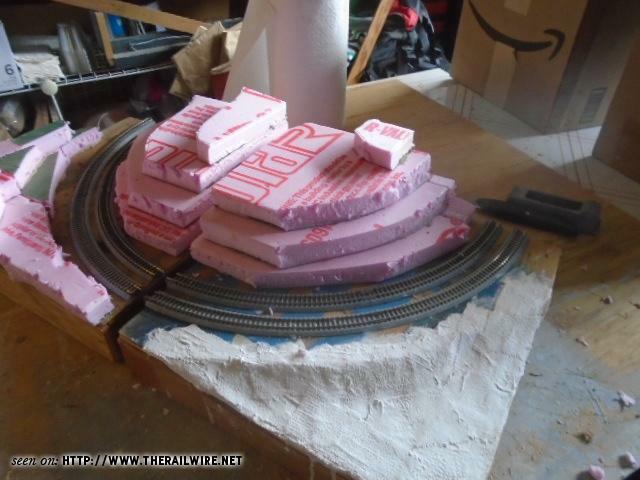 This will be the first module of a long-planned NP T-Trak layout. Stuff is on order so hoping it doesn't take too long to show up! 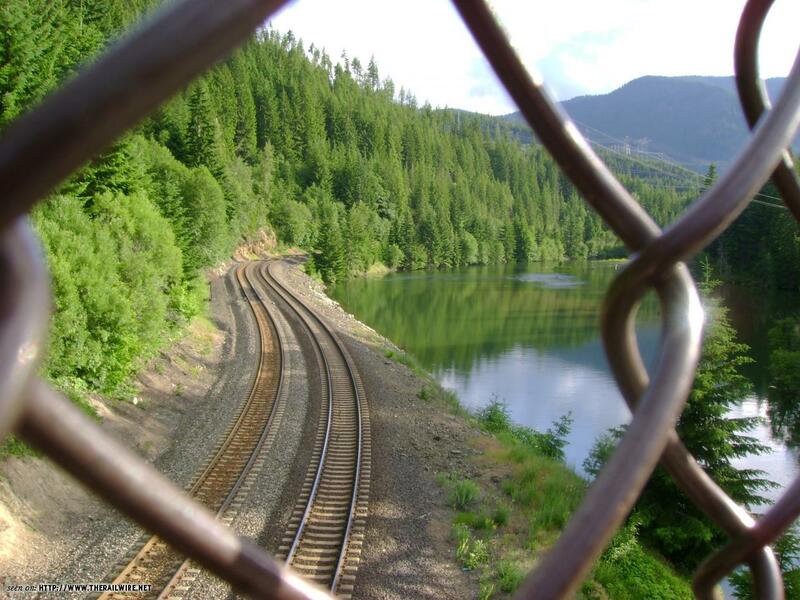 View from the trail looking down on the old NP line now BNSF. So will you be running trains on the NP or the Milwaukee? Are you going to model the catenary? Trains will be running on the NP double track (actually the main and a long siding). The Milwaukee line won't be powered but be available for posing equipment on. The full plan will have a triple module next to this one which will lengthen the dummy track. Not completely mainly in the aspect of time . I will at least model the steel supports on the bridge and the wooden poles for the rest. I do have the supplies to do it, but will just have to see if it's doable without looking poor. It's a bit more complicated than trolley wire. "It's a bit more complicated than trolley wire. " Definitely! 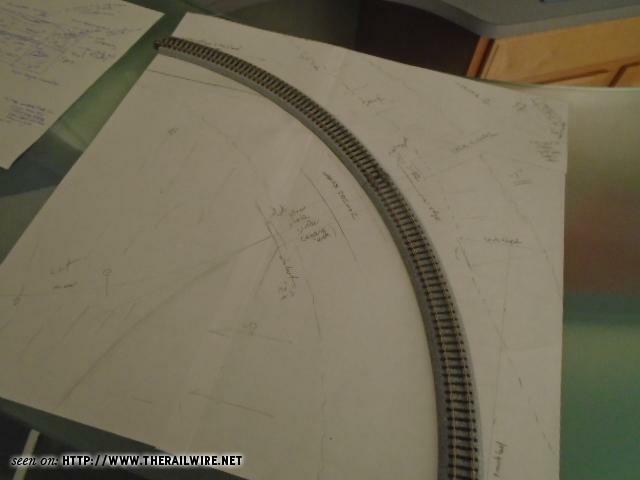 For a short, non-operating track, it should be practical, but will still require a lot of soldering, if you want the whole thing. If you'll settle for the post-1974 look, it wouldn't be that hard. They removed the trolley and feeder wires, as they were copper, and worth money. But they left everything else, including the messenger wire and hangers. Modeling that would be fairly simple, requiring just the poles, the messenger wire attached to the insulators, and some hangers, usually all shoved to one end of the span. The Coast Division didn't run electrics after 1972, as far as I know, and diesels would look just fine under the "retired" wires, but it would still mark the track as "Milwaukee Road". In the "should do something while I wait on orders" department , I drew a plan off of an properly-scaled sheet of paper to test the major elements . Everything looks like it will fit. I''ll flip the plan so it fits with the long term plan instead of how the aerial image shows up in the thread. I found a mix of Atlas and ME bridge parts that I won't be using for the SP layout including sections of C55 bridge track, so that's most everything I need once the module and track shows up. For the poles, at least the round ones, I'd recommend 1/16th inch brass rod. It takes a little more work to drill the crossarm holes, but mine have survived almost 20 years, including a few cats getting tangled in them. The wires didn't always come out so well, but the poles survived. going anywhere. All ready for terraforming on the bridge module along with its companion canyon module since the foam has been successfully glued together. Also started working on the bridge by cutting down the Walther's abutments to fit (these are nice kits along with the piers. 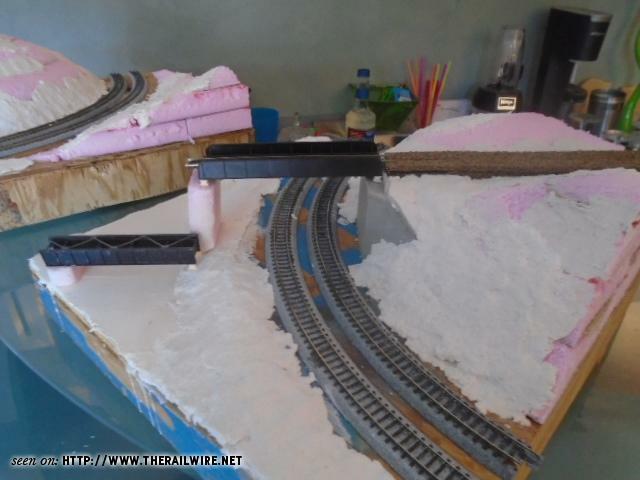 With a couple pieces of blank styrene you can stretch the kits to build 4 piers or abutments since double and single track pieces are included). I tore out the plate girder bridge on my old NP mini-layout and will use parts of it for the Milwaukee bridge. Continuing to work on the scenery base. Got the shaping done on the slope and the Milwaukee grade and filled some of the large gaps. Also got the first leveling coat down for the river and cut the abutment in. Once everything completely dries, I'll work on some ground details with Sculptamold. On the workbench, I got the piers and spans in progress. 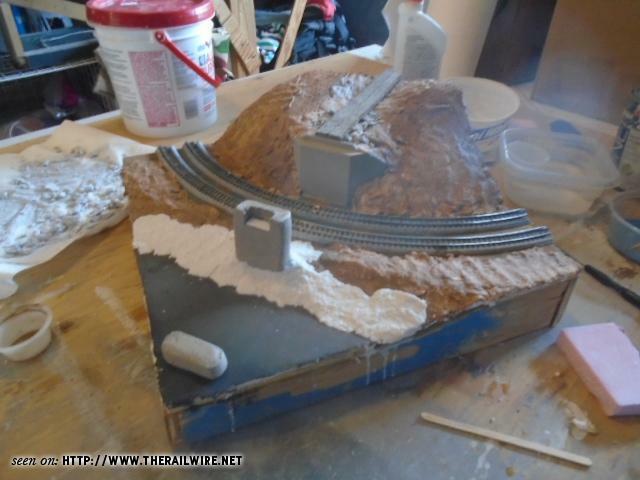 I added another coat of joint compound to the river so once that is smoothed a bit it will be ready for coloring. Sculptamold was also added to many surfaces to give more texture to the ground. 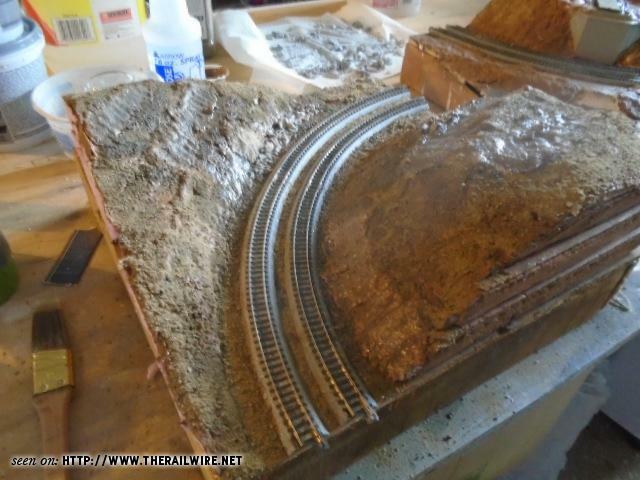 I also worked on leveling out the Milwaukee grade with a few layers of cork roadbed and shims in places. I still need to add some slope erosion effects here and there once it dries (I still have to keep bringing the modules inside to speed up drying as the garage is just a bit too cool). 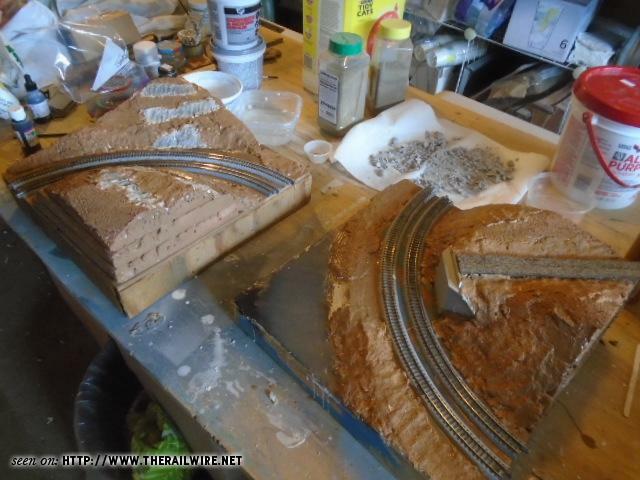 Rails are painted and ties drybrushed, so ballasting is coming up once the basic earth covering is finished. The picture shows a couple completed bridge spans being placed to adjust the piers for placement and cutting of benches to support the bridge shoes. Still have to build part of a deck truss and work on railings and catenary supports. Also started the first layer of earth and additional rock coloring on the companion "Yakima Canyon" module . If it looks wet it is... I'm waiting on finishing and getting the bridge piers installed before i start on the initial earth layers on the bridge module. Got the bridge piers in but I wasn't satisfied with the river banks as there is more bank between the bottom edge of the first pier and water. 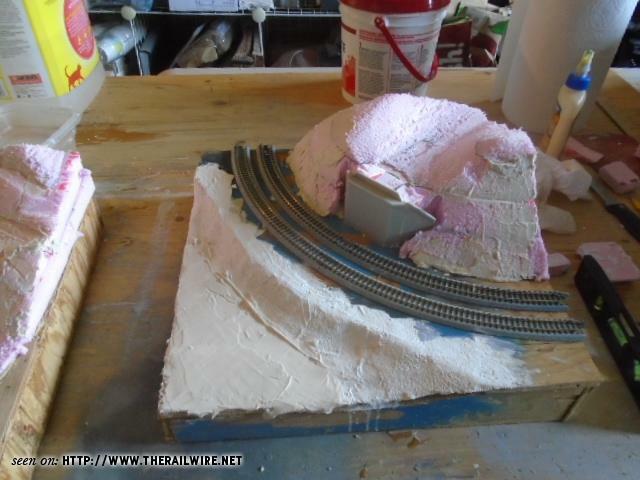 I re-contoured the banks with more Sculptamold which means I get to repaint the river bed. It's a half-step back but one forward. I went to a swap meet yesterday and picked up some static grass in "dead" and "dried-out" varieties which will look good in their respective places.